Our decking is 125×38 (nom) and is £1.95 per metre. We stock 3.6, 4.2 and 4.8 metre lengths. The decking is pressure treated and has an additional wax treatment. This water repellent slows down the rate of water absorption and evaporation, therefore ensuring the longevity of your deckboards. Our decking has a 20 year guarantee. 75×47 (3″x2″) decking joists which are £1.50 per metre and come in 4.8 metre lengths. 100×47 (4″x2″) decking joists which are £1.95 per metre and come in either 3.6 or 4.8 metre lengths. 150×47 (6″x2″) decking joists which are £2.75 per metre and come in either 3.6 or 4.8 metre lengths. 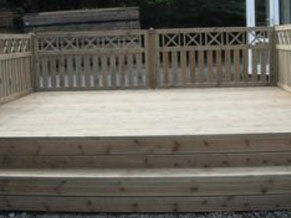 Decking panels are an easy way of finishing off your new decked area. They are 1.8m (approx 6′) wide and 0.9m (approx 3′) high. The panels are tanalised and cost £42. 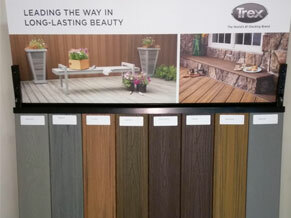 Why not come and have a look at our decking display.